Kitty Hawk is known the world over for its association with the Wright brothers and flight. The Wright brothers actually flew test flights on a series of hills named Kill Devil Hills, which were about 4 miles south of Kitty Hawk at the time. These hills, the tallest of which measured about 100 feet high, gave the brothers the height they needed to be able to glide down, plus because they were sand dunes, there were no obstructions such as trees. The almost constant winds were another reason the brothers chose Kitty Hawk. They arrived and departed from Kitty Hawk, and they found accommodations in the rural soundside community for some of their visits in the early 1900s. During the 25 or so years after the Wright brothers' successful flights, storms blew the tallest of the sand hills 450 feet to the south. It was stabilized there and established as the Wright Brothers Memorial in an opening ceremony in 1932 that Orville Wright attended. The old Kitty Hawk village is one of the oldest Outer Banks communities and even today has the feel of a bygone time, a bit removed from the modern-day rush and surge of development. 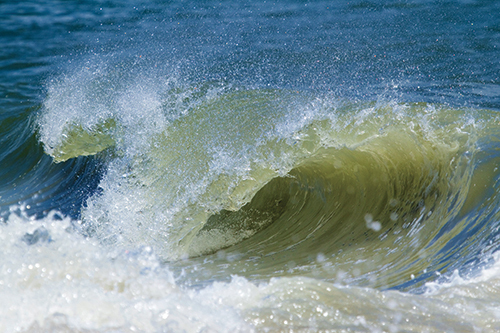 The town has purposely maintained a laid-back, older Outer Banks identity, and the locals and vacationers who call it home like it just that way, thank you very much. Which is not to say that Kitty Hawk restaurants or Kitty Hawk shops are sparse – quite the contrary. There are more than plenty of both. More than a century later, Kitty Hawk has shifted its focus from the soundside to the ocean. 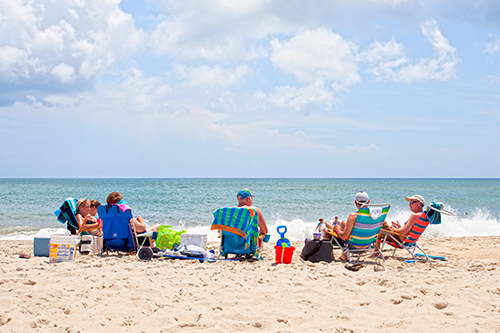 The beach draws thousands upon thousands of vacationers every year to Kitty Hawk, where a variety of accommodations await. Kitty Hawk is known for its old-school beachfront cottages, along with mom-and-pop motels and one of the nicest hotels on the beach. There's an appealing assortment of shops in Kitty Hawk that you probably won't find in your home town. Except for the Walmart (it's convenient) and a few other nationals such as Home Depot, the shops are individual and interesting. One thing to note if you're not from here is that the south side of the Bypass after you come over the Wright Memorial Bridge from the north is considered Kitty Hawk; the north side is Southern Shores. There are surf shops, other clothing stores, jewelry, furniture and antiques, specialty food places, spas, souvenir shops and more. And, don't think that you have to bring in your specialty foods: Harris Teeter in Kitty Hawk and those in nearby Kill Devil Hills are just as up to speed as in your home town. Even though Kitty Hawk is considered more of an old school community, it sure does shine where its places to eat are concerned. Kitty Hawk's restaurants are perhaps the most varied of any of the Outer Banks towns – Asian Infused, Pacific Rim, Thai, Italian, specialty wines/beers/cheeses, BBQ, hot dogs, Baja Peninsula, specialty seafood, vegetarian, high end cuisine, barefoot basics, martini bars . . . and that's honestly not even all. Several of these Kitty Hawk restaurants also double as music venues with regular (and top quality) musicians firing up the night after the dinner hour. Two official Kitty Hawk attractions attract visitors, one completely made by the hand of nature, one completely by the hand of man. Kitty Hawk Woods is an 1,877-acre maritime forest that could provide days of enjoyment for the amateur (or even professional) botanist or biologist with its diverse flora and fauna. On the other end of the spectrum is Sea Scape Golf Course, with its 18 holes that wind through the surrounding soundside neighborhood and that often offers spectacular ocean vistas from its fairways. And, speaking of the ocean, of course it's a major reason that vacationers (and locals) love calling Kitty Hawk home, whether that's for a week or a lifetime. But, when you're not sunning, shelling or swimming, there are plenty of other things to do in Kitty Hawk. If you're a gym rat or can't go a week without practicing your martial art, you have several choices. On the other end of that spectrum, you can massage or spa the day away. Or schedule a family beach portrait or take a long walk in the aforementioned woods. There are several places just for kids to explore and run off energy too. And if you left your surfboard, bicycle or SUP at home, don't worry; there's a convenient place to rent them. Kitty Hawk hotels run the gamut from a high end high rise to old family motels that have been around for decades and feel just right. Unlike most other northern Outer Banks towns, there are also two RV parks and a campground in Kitty Hawk. But like the other towns, vacation rental houses and cottages make up the majority of the places where visitors stay. How did Kitty Hawk get its name? The most accepted idea of Kitty Hawk's name is that it evolved and was Anglicized from a Native American term that referred to the area as Chickahauk. But it could also be a version of terms for hunting geese, Killy Honker or Killy Honk. Did the Wright brothers take their historic flights in Kitty Hawk? The area where the Wright brothers first flew their powered flights is today known as Kill Devil Hills. In 1903, however, when the successful flights took place, it was an area known as Kitty Hawk. The name of the dunes that the Wrights used to test their gliders were known as Kill Devil Hills, the tallest of which was 100 feet. This hill was eventually blown south and was stabilized as the present-day site of the Wright Brothers National Memorial, which is now in the town of Kill Devil Hills. What airport is the best to fly into if we're coming to Kitty Hawk? Most visitors who need to fly in for their Kitty Hawk vacation come through Norfolk International Airport (ORF). From there they rent a car and drive the almost-two-hour trip to the northern entrance to the Outer Banks into Kitty Hawk. Some also choose to go through Raleigh/Durham International (RDU). Flights that come from the West Coast area sometimes have more options coming into Raleigh. The drive from that airport is approximately three hours to get to the Outer Banks, where you arrive over the Virginia Dare Bridge onto Roanoke Island then over the causeway, a few more miles, to Nags Head. For small private jets there is an airport in Manteo and an airstrip in Kill Devil Hills. Where is Kitty Hawk located on the Outer Banks? 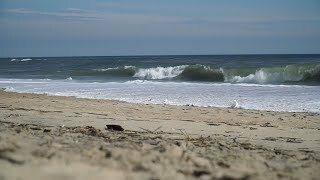 Kitty Hawk is on the northern Outer Banks, just north of Kill Devil Hills (which is considered the most central of the towns on the north/south-oriented Outer Banks) and just south of Southern Shores. Visitors will need to look for the town markers indicating when they leave Kill Devil Hills or Southern Shores to know they're in Kitty Hawk proper. For those who don't know the area well, the drive north or south along the Bypass (the five-lane main corridor that runs through the beach communities) or the Beach Road (the two-lane road that parallels the Bypass) appears to be through one long town. What's different about Kitty Hawk vs. the other Outer Banks towns? Kitty Hawk is less flashy than neighboring towns such as Nags Head or Duck. It's a comfortable place that's easy in its own skin, knowing that visitors and residents like it for its own merits. The rental houses are average size, for the most part – none of the mega-mansions that other towns sport, and that's really part of Kitty Hawk's charm. It feels more like the Outer Banks from a few decades ago. That said, it's also home to a lot of really good restaurants, all within a few miles circumference, and one of the top-end resort hotels in the area. What are the drive times to other Outer Banks towns? Where are the lifeguard stands in Kitty Hawk? Kitty Hawk has three lifeguard stands where guards on duty from Memorial Day through Labor Day from 10 a.m. to 7 p.m. After Labor Day, guards patrol the beach on ATVs and in trucks until mid-October. It is highly recommended that you swim within sight of a lifeguard. The currents and wave heights here are usually much stronger and higher than many people are used to. Also, if red flags are flying it means that it is against the law to swim in the ocean that day. In addition to the guarded accesses below, Kitty Hawk has nine other public beach accesses. Showers can be found at Byrd Street, Kitty Hawk Bathhouse and Lillian Street (MP 4).